South African food is vibrant and highly fascinating to most first-time visitors to our beloved culturally diverse country. 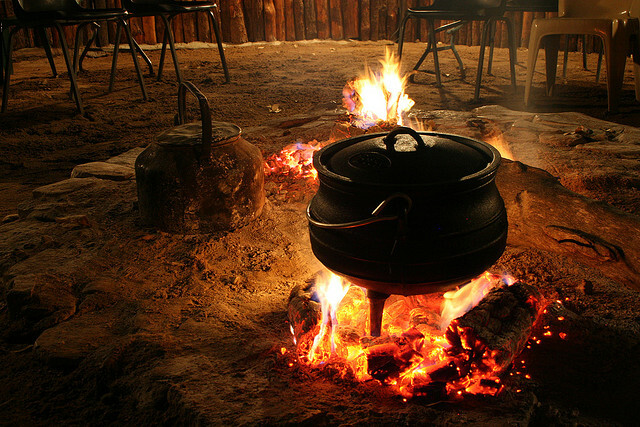 A well-prepared traditional meal may just prove to be the highlight of your travels to South Africa. Several bistros and restaurants specialize in South African cuisine and serve a great multitude of traditional Saffa-dishes for your enjoyment. Attempting some tasty traditional African meal ought to be part of every visitor’s itinerary. As with most countries, South Africa’s food heritage is firmly intertwined in its history and the make-up of its people and their identities. A variety of specialized dining establishments in South Africa do an outstanding job of offering both conventional and contemporary African meals to visitors and the general public. Each recipe mirrors one or more of the different cultural influences discovered around the African continent. Naturally the Rainbow nation boasts a multitude of cuisines, all forming a part of the iridescent tapestry that makes up our South African heritage. 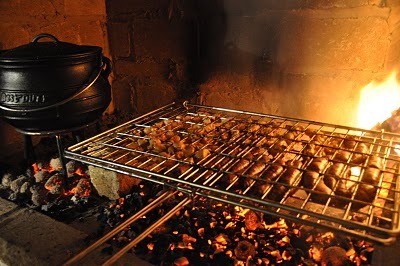 A traditional African meal is typically prepared over a fire or inside a 3-legged pot (also known in Afrikaans as a “Potjie”), therefore meat is mostly served grilled or as a stew. The meat is usually accompanied by some kind of starch e.g. rice or potatoes. Most often the starch of choice would be a local Maize porridge, also known “mieliepap” in Afrikaans, or “phutu pap”, depending on the consistency of the final products. This savoury African creation usually comes with pumpkin, beetroot, cabbage and carrots as the main vegetables. Mieliepap can also be served as a crumbly breakfast option, perfect with some sugar and milk. Other common South African meals consist of Morogo, Tripe, Amadumbe, Chakalaka, and the well-known boerewors roll (a kind of beef sausage on a white hot-dog roll). Tripe is a traditional meal highly favoured by a many Africans. In the Western Cape this kind of fare is considered a regional delicacy and is commonly offered lightly curried and is served accompanied with smallish potatoes and some fried onions depending on your personal taste. Morogo is a kind of wild green spinach. It is combined with butter-braised onions and tomato or even mixed into traditional maize porridge; it is seen as a rural ingredient with traditional appeal and charm. Amadumbe is a pleasant potato and peanut mash. A delicious bistro variant of this meal is to prepare some potatoes, mash them up with some butter and sprinkle them with roasted peanuts, rounded off with a trickle of honey. Chakalaka is a spicy relish served together with the main dish and contains green peppers, grated carrots, sliced-up onions, vinegar and chilli. Most cooks and housewives pride themselves on that one secret key ingredient which will differentiate their offering from another cook’s chakalaka. Perfect spooned over “stywe pap”, chakalaka serves as more of a condiment than a stand-alone part of a plate of food. The boerewors roll is a wholly South African food. 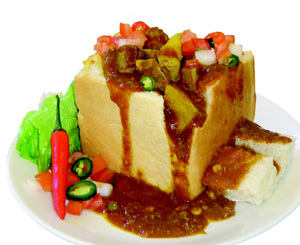 It is seen as the South African version of the NYC hot-dogs. Normally seen at a roadside stands and just outside supermarkets and butcheries, boerewors (an assortment of spicy sausage meat) is grilled over an open flame, then placed on a roll (white bread bun) and then it’s covered in tomato sauce and mustard. What more can I say – Just delicious! Various other regional favourites include a wide range of scrumptious Cape Malay meals, traditional South African biltong (South African version of beef jerky) and not to mention the famous curries and Bunny-chows of Kwa-Zulu Natal. If you want to try something more the wilder side you should try smoked chicken feet and heads — referred to as the “walkie-talkies” — a very popular meal in the rural part of South Africa and served in townships as take-away fare. We are certainly not forgetting those foodies who have a bit of a sweet-tooth. South Africans love their desserts and boast many unique and tasty after-dinner specialities. Top of our list has to be the koeksister – a type of sticky, syrupy doughnut consisting of plaited dough which is deep-fried and then smothered in home-made syrup. This sweet treat has its origins in the Western Cape and is a variant of the more traditional Malay koeksister which is not as terribly sweet and contains more fragrant spices. It is also not plaited and is traditionally sprinkled with coconut. Both versions are completely delectable in their own way. Melktert is another favourite, literally translated as ‘milk tart’ – reminiscent of a baked custard but with wonderful warm notes of cinnamon and nutmeg. This tart can be served hot or cold, with or without a crust and is the perfect afternoon tea-time treat. Malva pudding is a delicious caramelised baked sponge-pudding also from the Cape region. The word “malva” refers to the Rose geranium leaves which were traditionally placed on the bottom of the baking dish before the dough was poured in. Today this part of the recipe is generally left out which is a shame as it is such a delightful aspect which makes this desert uniquely South African.